Thirty-two officials from Vietnam’s Ministry of Agriculture and Rural Development, and the Petrovietnam Fertilizer and Chemical Corporation visited IRRI on 11 June to learn more about the Institute’s research activities, particularly the Closing rice yield gaps in Asia with reduced environmental footprint (CORIGAP). CORIGAP, a project under the Irrigated Rice Research Consortium (IRRC) and funded by the Swiss Agency for Development and Cooperation, aims to optimize productivity and sustainability of irrigated rice production systems in several Asian countries including Vietnam. The delegates were briefed by Dr. Grant Singleton, CORIGAP coordinator, on the activities of both IRRC and CORIGAP in Vietnam. Dr. Bjoern Ole Sander, climate change specialist, presented his team’s research on climate change while Dr. Roland Buresh, soil scientist, discussed site-specific nutrient management. IRRC developed the principles for site-specific nutrient management which has evolved into the Rice Crop Manager decision-support tool. The visit was arranged by Dr. Pham Van Du, deputy director general of the Department of Crop Production, Vietnam, in coordination with the project office of CORIGAP. Key stakeholders of the Vietnamese rice sector gathered to discuss strategies towards a sustainable rice value chain in the Mekong Delta on 5-6 June in Ho Chi Minh City. The workshop aimed to engage participants in a multistakeholder discussion about the future of the Vietnamese rice industry. IRRI organized the event with support from Closing rice yield gaps in Asia with reduced environmental footprint (CORIGAP), a project funded by the Swiss Agency for Development and Cooperation, and the Agriculture Competitiveness Project funded by the World Bank. Participants included representatives from the Department of Agriculture and Rural Development, research institutes, and the private sector including exporters, farmer cooperatives, and the food industry. Indonesian and Thai partners from the CORIGAP project also attended the workshop as a learning experience to reproduce the exercise in their respective countries. A SWOT analysis (strengths, weakness, opportunities, and threats) combined with a strategic orientation round (SOR) was used to engage discussion among stakeholders. The theory and procedure was developed and instructed by Dr. Pieter Rutsaert, CORIGAP postdoctoral fellow, while Dr. Matty Demont, IRRI senior economist and market research and value chain specialist, framed the analysis around the concept of sustainable food value chain development. The framework covered the triple bottom line of economic, social, and environmental sustainability. Participants were guided through several collective tasks to uncover the strengths and weaknesses of the Vietnamese rice sector to become more sustainable, and the opportunities and threats that the sector faces. Participants then individually quantified the relationships between internal and external drivers of the sector. These results will enable CORIGAP scientists to develop an overall strategy for sustainable development of Vietnamese rice value chains. The stakeholders perceive the sector’s capability to grasp opportunities (including growing export and domestic markets) to be higher than its resilience to potential threats (including more stringent food safety regulations and global warming). This finding is important for policymakers who are currently repositioning Vietnam on the international rice market. to secure food for billions globally, before writers and illustrators during the AFCC 2014 in Singapore. Asia’s food staple was the theme of the 5-day Asian Festival of Children’s Content (AFCC) held last week at the National Library of Singapore. The International Rice Research Institute (IRRI), in support of the AFCC 2014 theme which is rice, launched two children’s books and an exhibit booth at the Library plaza. The two books are The Rice Books for Kids by Norma Chikiamco and Travels of Little Rice Grass by Anupa Roy. Also launched during the AFCC was All About Rice, a bibliography of rice-themed books, published by the National Book Development Council of Singapore; the Rice Bowl Game, an interactive digital setup developed by VastPotato; and an “urban rice paddy,” an installation artwork by the Edible Art Movement. A featured talk, Rice: Science, Art, and Magic, was given during the AFCC by Tony Lambino, head of communication at IRRI, who expounded on IRRI’s success stories to an audience composed primarily of producers or consumers of literature and other media formats for children. Analogies were drawn between magical moments in the research and creative process. Through these activities, IRRI introduced its mission and work, particularly on research aimed at making rice a healthier part of the Asian diet and, for farmers, making rice more resilient against climate change. Tony told the story of how some IRRI-developed rice varieties have saved whole countries from famine in the past, and how IRRI’s work evolves to address new challenges in securing the world’s food. IRRI continues to help regions overcome not only hunger and poverty but the onslaught of extreme climate events that leave poor rice farmers destitute and put them at severe risk of losing investments in any cropping season. Also, through its healthier rice portfolio, IRRI and its partners aim to address malnutrition or “hidden hunger,” which affects two billion people globally. IRRI believes that exposing children very early to what it takes to produce rice, as well as to the crucial contributions of science to ensuring food security, is important not only for them to appreciate what it takes for a bowl of rice to get to the table but to hopefully make agriculture a future career option for the best and most creative minds. Claire Chiang, chair of the board of advisors of the AFCC, said in the foreword for All About Rice: "Our thanks and appreciation to IRRI for enriching the project with an information booth full of interesting facts, stories and beautiful photos, a talk on Rice: Science, Art and Magic, introducing authors of rice-themed picture books, and inspiring the creation of a virtual reality rice-bowl challenge and an interactive art installation." Though not a rice-growing country, Singapore is home to some of IRRI’s partners and supporters of its research. It is also a major market for special types of rice that are preferred by discriminating palates, common in cosmopolitan cultures. These special rice types are also more expensive, and represent an opportunity for some farmers to earn more per kilogram of produce. Part of IRRI’s work also seeks to help farmers earn more from rice farming and thus improve their livelihoods. IRRI's participation at the AFCC was coordinated by Flaminia Lilli of IRRI Fund Singapore. one of India’s largest conglomerate holding companies—organized the Farmer-Experts Live Interaction Program, a 90-minute interactive TV program for farmers where they can phone in their questions about agriculture. To answer the questions, Reliance Foundation invited senior IRRI staff members, CSISA extension agronomist, and Mr. Needhibathi, a local farmer that has been collaborating with CSISA for several years. The Farmer-Experts Live Interaction Program introduced the project, the role of the different participating implementation agencies, and its donors to viewers. To encourage viewers to participate in the live question and answer part of the program, water scarcity and labor shortage—the major constraints facing farmers in the Cauvery Delta—were highlighted. Viewers phoned in questions about conservation agriculture, crop establishment using minimal labor and water, laser land leveling, and dry seeded rice (DSR) using seed drills, and weed management. Possible solutions through resource-conserving technologies, especially novel crop establishment methods, were outlined. The different methods were introduced by short video clips. The panel of experts discussed the main advantages of adopting the DSR technology such as reduced seed rate, water saving, line sowing, applying seed and fertilizer at the same time, and the cost savings. Mr. Needhibathi shared his experience about DSR especially higher yields, higher profits and more flexibility for planting. Pre- and post-emergence herbicide application program developed by CSISA were also presented to the viewers. Farmer-Experts Live Interaction Program also covered mechanically transplanted non-puddled rice and the service provider model. In addition, CSISA experts outlined the employment prospects that mechanization and the introduction of conservation agriculture can bring to the rural youths by becoming service providers to farmers. The Farmer-Experts Live Interaction Program is broadcasted once monthly on Zen TV, a local TV channel, to create mass awareness and disseminate the location-specific information on agriculture. It is screened in 4 districts within the CSISA hub domain. Partners of Diversification and intensification of rice-based cropping systems in lower Myanmar held a workshop on 18-19 May in Yezin. The 4-year project, which is funded by the Australian Centre for International Agricultural Research, conducts research on cropping options to increase and sustain productivity of both cropping systems in Maubin Township in Ayeyarwaddy, and in Daik Oo Township in Bago. Project partners who attended the activity included Dr. Ye Tin Htun, deputy director general of the Department of Agricultural Research, and Dr. Aye Min, project manager at the Department of Agriculture of the Ministry of Agriculture and Irrigation The IRRI Myanmar office was represented by Dr. Romeo Labios, U Than Aye, Dr. Nyo Me Thwe, U Aung Myo Thant, Daw Aye Hnin Yu, Daw Su Su San, and Christopher Cabardo. Martin Gummert leads the post-harvest component of the project. The participants discussed the work and financial plans, and protocols of the prioritized activities for the 2014 wet season and the 2014-15 dry season.. They also considered other researchable and capacity-building areas, including strategies to meet the project’s aims. The Climate Change, Agriculture and Food Security Regional Program for Southeast Asia (CCAFS-SEA) recently concluded a collective engagement and communication program workshop at the Agricultural Genetics Institute in Hanoi, Vietnam on 29-30 May. The workshop participants drew insights from best practices of CGIAR member-centers, developed a roadmap to actively engage partners, and draw an overall communication plan to support the implementation of CCAFS research agenda and priorities. “Results of this communication workshop will feed into the overall CCAFS regional impact pathway, which will be finalized in a workshop to be held on October 2014,”said Dr. Leo Sebastian, CCAFS-SEA’s regional program leader. The workshop output will also serve as the platform for information sharing and communication engagement on climate change issues among the centers. Participants included heads and senior communication staff from the International Center for Tropical Agriculture, Center for International Forestry Research, International Potato Center, World Agroforestry Centre, International Crops Research Institute for the Semi-Arid Tropics, International Water Management Institute, International Rice Research Institute, CCAFS staff, and selected media partners in Cambodia, Indonesia, Lao PDR, Vietnam and the Philippines. To come up with substantive inputs for the CCAFS impact pathway, experiences and learning in the current communication and knowledge sharing initiatives among participating CGIAR centers were harnessed. Highlighted in the brainstorming and workshop sessions were potential engagement strategies and identification of communication needs and complementary tools and platforms that could help catalyze behavior change among the ‘next-users’ (e.g. government, academe, civil society, development partners etc.) who directly work with ‘end-users’ (e.g. farmers, fishers etc.) in the climate change adaptation and mitigation continuum. Measures of collective performance were also outlined to gauge stakeholder impacts and outcomes. CCAFS-SEA, the newest region of the CCAFS global network, provides a platform for credible and authoritative scientific information, and knowledge and tools on agriculture and food security in the context of climate change. The CCAFS communication network could help amplify CGIAR centers’ initiatives to help farmers adapt to and mitigate the effects of climate change. A huge part of IRRI’s research contributes toward making rice production sustainable and environment-friendly through the development of climate-smart rice varieties that can tolerate effects of climate change like flood, drought, and salinity. 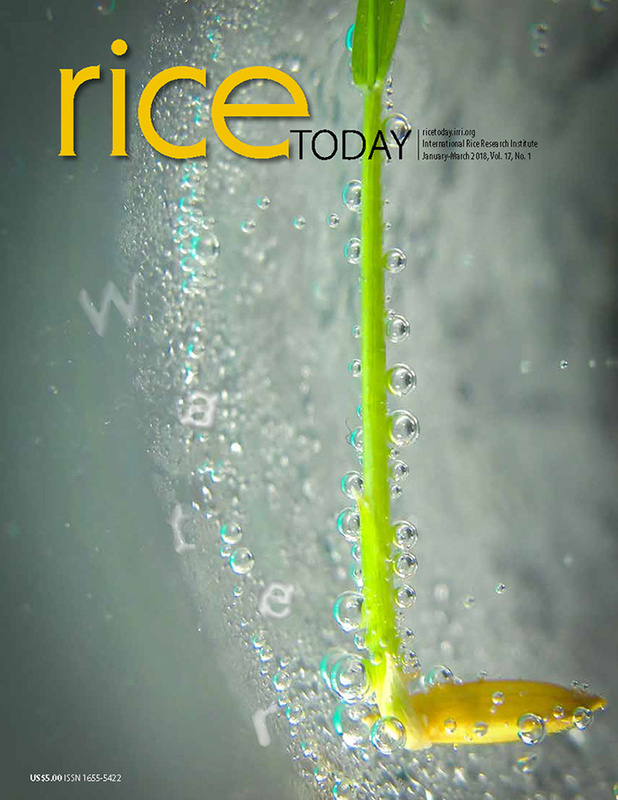 IRRI also developed “alternate wetting and drying” (AWD) that not only lessens the amount of water used in producing rice but also reduces the emission of the greenhouse gas methane from rice paddies.